Several members of Reproductive Justice New Brunswick were present for the Fredericton-area Liberal campaign launch on Saturday, August 3rd. 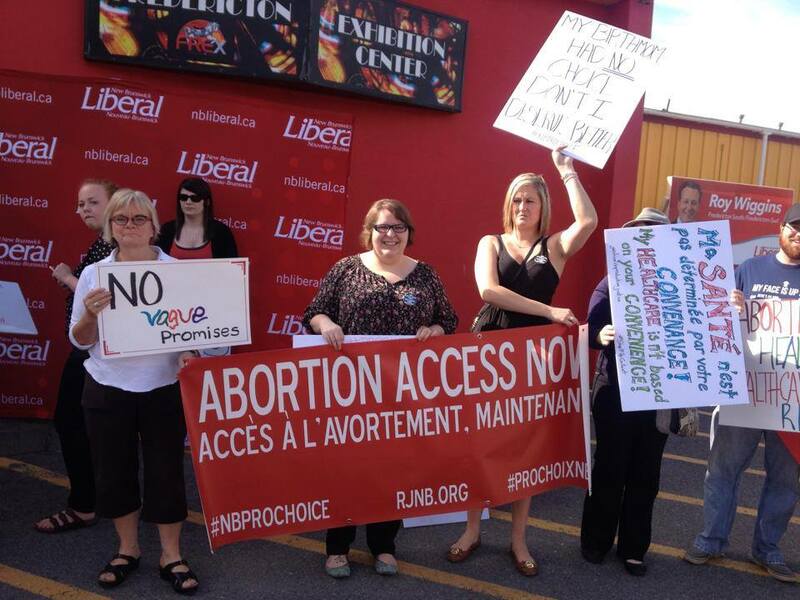 With an ‘Abortion Access Now’ banner and ‘No vague Promises’ and ‘Show us your repeal Timeline’ posters, RJNB hoped to reinforce the importance of the Liberals clarifying their stance on improving abortion access in NB, and how they plan to “identify all barriers to a woman’s right to choose and eliminate them“. Although not indicated on the invitation or ticket, RJNB members were told only official Liberal party signs were allowed in the building. Most members remained outside, and were told that nothing in regards to reproductive heath was mentioned. -Repeal Medical Services Payment Act, Section 2.01, which prohibits government funding of “entitled services furnished in a private hospital facility in the Province”. NB Liberal leader Brian Gallant: you know #NBProchoice is heading to the polls. The Green and NDP parties have promised repeal, unequivocally. Stand behind your convictions and inform us of the decisive action you’ll take in regards to abortion access if you’re elected. No more vague promises. No more reviews. New Brunswick deserves safe, accessible, government funded abortion, NOW.